Much as it was for George Michael, 'Last Christmas' wasn't a particularly good one for Mossley. The only bright spot in their Boxing Day game at home Lancaster City was that the visitors failed to add to their four unanswered first half goals after the interval. 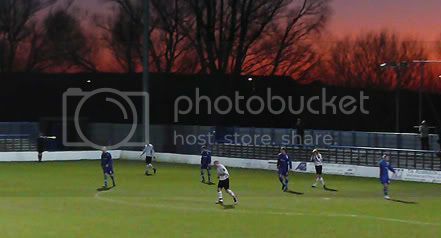 366 days on though the Lilywhites faithful were saved from tears on St Stephen's Day by a solitary goal which was enough for Mossley to edge out Curzon Ashton in a closely fought (albeit a bit too literally at times) encounter. It came just after the hour mark when a through ball from Danny Self split the Ashton defence open and played Chris Hirst into a one-on-one with Blues keeper David Carnell. The chance looked to have gone when his heavy first touch took the ball away from the goal and narrowed the angle available to him but his second was sublime, deftly lifting the ball over the onrushing Carnell with the outside of his right boot to send the ball bouncing into the back of the net. The goal was the culmination of a lengthy spell of Mossley pressure that had begun the moment the second period had started. 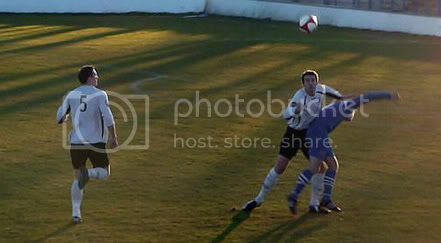 Graham Kay hit the crossbar with a header from the edge of the box and a good few other efforts flew over it as some wayward finishing stopped them from not only opening the scoring earlier than they did, but widening the gap between themselves and Curzon before the lead they held came under any kind of threat. Graham Kay pays close attention to Glynn Barker. On the few occasions the visitors back line was breached and that danger did arrive, they had the goalkeeper Andy Robertson to thank for ensuring the slender lead remained intact. Ten minutes after Hirst's strike Robertson produced an outstanding reaction save to palm away a Michael Norton shot when a goal looked inevitable. This was followed moments later by the Mossley keeper winning his final confrontation of the afternoon with the Blue's leading scorer by diverting a shot onto the roof of the net when a goal once again looked like being the only outcome. Good fortune isn't something Mossley have had a great deal of this season but they got a rare slice of luck with five minutes of the game left. Losing his marker as a free-kick from the right was looped into the Lilywhites penalty area, Adam Jones looked certain to level the scores as he met the ball on the edge of the six yard box. Inexplicably however he headed high over the crossbar with the goal at his mercy and with it went his sides chances of rescuing the game. That the second half was as interesting as it was came as something of a surprise after a leaden opening to the match which suggested that the excesses of previous day were still weighing heavily on the stomachs of all involved. Only on four occasions did the first half spring into life - twice for the home side, twice for the visitors and all brought about by mistakes from the defending team. The first fell Curzon's way in the 23rd minute when a misjudged call from Robertson allowed Norton to nip between him and the defence and steal the ball. The Lilywhites custodian reacted quickly though to rectify his error and dropped on Norton's shot as he attempted to roll it into the empty net. An overhit back pass from Nick Boothby was the genesis of Mossley's next brush with danger and it was only some excellent covering defending that prevented Glynn Barker from tapping the ball in from close range. At the opposite end of the pitch Mossley, and Danny Dignan in particular, were benefiting from some equally generous gifts from their hosts. A sloppy pass from Chris Worsley presented Dignan with the ball and from fully thirty yards he unleashed a ferocious shot that scraped the outside of the post and had Carnell flying across the face of his goal in a forlorn attempt to reach it. Carnell did get to Dignan's second effort though just before break, diverting it wide after an elementary error from David Birch had let in the Mossley forward. In the end though it was to be just the one goal that separated the two sides and the noise and applause that greeted the final whistle from the visiting supporters was the least the Mossley players deserved for their efforts over the course of the preceding hour and a half. Efforts which ensured they ended 2008 on a high with their fourth successive victory, their first Boxing Day win for five years and their first in four attempts at Curzon's new ground. I'd love to write more about this match, and I may do so at a later date, but it's Christmas and I'd much rather be doing something else so if you don't mind I'll leave it here. What I will say though, besides well done Mossley, really well done, is that I hope the return fixture on New Years Day is officiated by people who don't appear to be voice operated by the Curzon bench and/or aren't unafraid of having to fill out paperwork for red cards off on a public holiday. There's no question that the home side should have finished the match with less than the full compliment of eleven players out on the pitch as, not for the first time, the Blues reaction to having things not go their own seemed to be if you can't beat them – kick them. Some of the challenges that took place, especially after they'd gone behind, were utterly appalling . Yet they all somehow went unpunished, even one on Hirst that almost took the assistant referee out of the game such was the way the home player threw himself into the challenge on the touchline. You'd have hoped that after he'd almost ended up in a heap on the side of the pitch that he'd draw the referee's attention to what happened but no – it was just another in a long line of matches where it appeared the linesmen were only allowed to signal for throw-ins and nothing else. To finish with, even though I can't bring you footage of the goal through the Unibond's 'no publicity is better than any' policy, I can show you what happened after the match finished which is the victorious Lilywhites receiving the applause of the crowd and reciprocating with their appreciation of the support they received.